Thanks for choosing Wasser Vela Metal Spray Nozzle! This pistol water nozzle is new design and good feature. We specially design the soft, extra fine shower, which is included in this multi-pattern water nozzle. The very fine and larger Mist is also good for watering orchid. Telescoping long wand from 25"-36"
You may adjust to any length between 25"-36" as you want by easily un-screwing and screwing the nut. 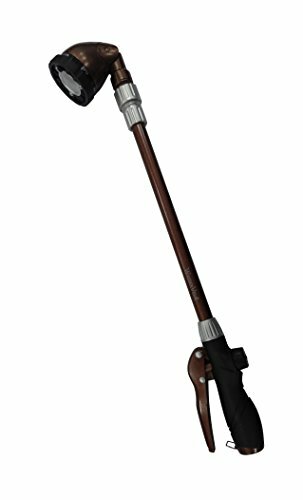 The handle is made by durable die cast zinc, with light durable aluminum tube and plastic head, which is the best comfortable handheld weight design. The overall extended length of wand is 36" long, after filled up with water, it is heavy. This is why we design this best suitable metal and plastic combination wand. Shiny metal clip can reduce hand fatigue when holding pistol nozzle. When you fill up tank and need the water coming out continually, the metal clip can hold the lever and let the water keep running. It is difficult to adjust the water flow when you have wet hand, so we design the large flow control knob for easy usage. A rubber grip on the turret head is for you to easily adjust different water patterns with wet hand. Also, it prevents touching hot or cold hard surface when adjust water pattern. No squeezing handle = no more tired hands! If you have any questions about this product by Wasser Vela, contact us by completing and submitting the form below. If you are looking for a specif part number, please include it with your message.